What's the best way to identify knockoff fashion from designer items? What’s the Best Way to Identify Knockoffs From Designer Items? 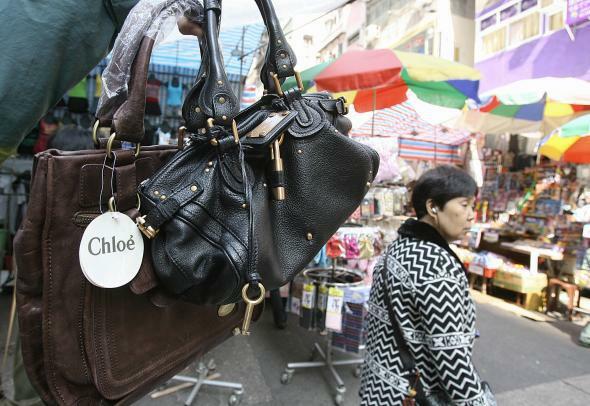 Fake designer bags at a Hong Kong market in 2007. Fakes are harder and harder to differentiate from the real ones, as production houses that produce the real ones are starting to “knock off” the very work that they do for expensive luxury labels. However, the best way to recognize fakes is to look at the details. Listed below are five good details to look for when distinguishing a fake from a real product. Stitching on fakes is sloppily done. The lines are not clean, the threads are not trimmed, and often times the seams are not sewn straight. The quality of the fabric or leather will be compromised in fakes, because as you know, the way to get costs down is to use a cheaper alternative. If you can produce a fake in China, it’s way cheaper than going to a mill in Italy to have something custom made. Hence the fakes will feel cheaper to your touch. Again, you get what you pay for. Zippers and buttons or findings will be of substandard quality. Buttons will feel lighter if they are made of plastic-coated in metal instead of real metal. Zippers will come off the tracks or lose teeth prematurely if they are fake. The goodies. The real bags and shoes always come with the dust bags, the box, even ID cards for certain designers. Cheap imitations will not have these, or if they do, even the dust bags will have a cheap feel to them. Don’t get caught trying to buy fakes abroad. It is actually illegal in some countries, and rumor has it you could get caught at customs—not a great way to make your way back to the U.S. at all. Fashion and Style: Does watching the Victoria’s Secret fashion show make women feel inadequate? Fashion Trends: Why is Lululemon so popular? Fashion and Style: What is the difference between made to measure and bespoke?